You know those cute little takeout containers you get, often from Chinese restaurants? We just learned some new things about them, and our minds are still blown. Here are some fun facts about them, so should the topic come up at trivia, or during dinner convo, we’ve got you covered. 1. They’ve been around since 1894. Yep, on November 13, 1894 in Chicago, the inventor Frederick Weeks Wilcox patented something he called the “paper pail,” according to The New York Times Magazine. It consisted of one piece of paper folded into a leakproof container, complete with a wire handle. Sound familiar?! So, this November, the takeout container will celebrate its 122nd birthday! 2. The shape’s modeled after another container… that carried oysters. 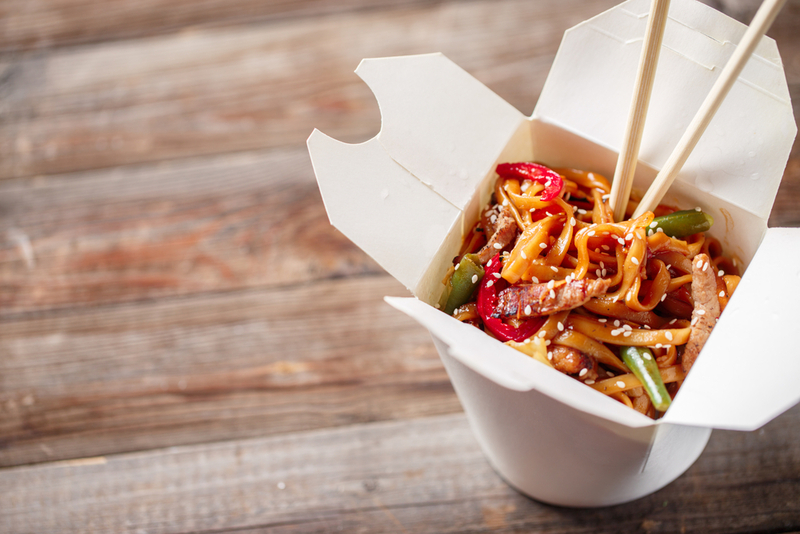 The Chinese food takeout containers that we know and love are based on little wooden pails that were used to carry raw oysters back in the 19th century, reported Eater. In-te-rest-ing. 3. The flat interior helps food slide out when it’s time to eat the leftovers. ICYMI, that flat interior helps our leftover food slip right onto our plates, according to The New York Times Magazine. Genius. Just think about other takeout containers (like Styrofoam) and how tricky it is to get every morsel of our leftovers out of them. With the white takeout boxes, no waste here, which means more for us. A win-win. 4. Many of them are recyclable & microwaveable. Ever since Wilcox’s invention, a lot of people have imitated the white, fold-up, takeout box. For instance, Fold-Pak may have as much as 70 percent of the market share, reported Eater. And theirs are recyclable and microwaveable, Fold-Pak states on its website. Who knew, amirite?! Can’t say that about certain other takeout containers. 5. The takeout containers can also be used as a plate. We had no idea about this one, either, that you could use your takeout container as a plate. Why didn’t anyone tell us this sooner?! Just unfold it and voilà!